When you have a link on a web page, certain spots on that webpage have better placement than others. Looking at the heat map below, the dark orange spots show the strongest placement of a link and the light yellow spots show the weakest placement of links. It is important to have the link surrounded by “keyword rich” phrases to give it an even greater chance someone will click on the link to your website. To have your link be in the “most ideal” spot, you will want it to appear “above the fold.” What this means is when a webpage is open the user does not need to scroll down on the page to see your link. Having your link placed in a “user focused area,” or on one of the darker orange spots, is going to give your link the highest chance of being seen, clicked on, and give your site even higher creditability. Having creditability is important because it will help build the organic search engine results, page rank and in the end give you more business than your competitors. Mahaney, S (2008). 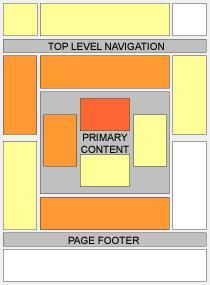 Search Engine News; 9 Critical Steps to Evaluating Link Quality. Planet Ocean Communications, Inc.